Almost forty students gathered to display their skills and progress at the March 10th Black Belt test. As a testament to Grandmaster Wong’s ability to challenge and nurture his students, we had a huge number of higher degrees. In all, ten tested for their Black Belts, ten for 1st Degree, five for 2nd Degree, three for 3rd Degree, eleven more for 4th -6th degree. Students participating in the exam were required to display their abilities from kicking, stance work, self-defense applications, grappling, throwing, breaking, to illustrating their hand and weapons forms, as well as having to go through the physical conditioning challenge from sit-ups to horse stance, from palm to panther fist push-ups for each Black Belt level involved. Congrats to all students who took the rigorous challenge and graduated to Black Belt and higher degrees. Special congratulations to students testing this day who’ve been with the Academy for more than 20 years: David Spivack, Bonnie Sid, and Greg Chuck: receiving 4th, 5th and 6th degree Black Belt awards. And, special congrats to families testing together: Danielle Lewis and her daughter Gwen; David Spivack and his daughter Arielle; and Sihing Michael Bauld and his Dad, William Bauld. Long time students, competition and performance team members Tayler Lim, William Bauld and Les Allen received 3rd Degree Black Belts, Thomas So, Gabriella Sarrouh, Stephanie Lowe, and Alexi Drier received their 4th Degree Black Belts, and Sihing Wesley Prager received his 5th degree Black Belt. The level of skill displayed over the long day of testing as well as the degree of encouragement and support that came from the participants, family and friends attending, and the Instructors conducting the exam, demonstrated how Tat Wong Kung Fu Academy is not just a school but a community. 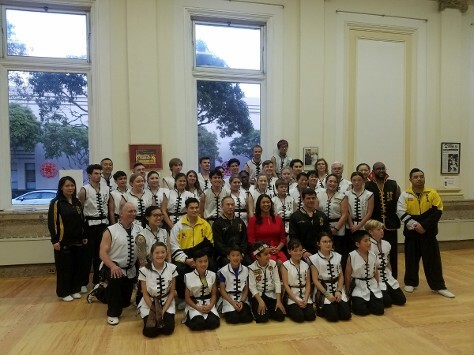 Congrats to these dedicated graduates below who have now achieved their Black Belts, 1st and 2nd Degrees, and after years of dedication as well, have displayed refined skills and improved their all-around health and fitness through Kung Fu.